New Orleans, home of mardi gras, the saints, and not so healthy food. But also known for its flat and bumpy roads. Mom and I went on down to NOLA for the Rock n Roll race which we registered for last year and this was the first race we have done since the fire. It was an okay race, nice and flat, warm and took us throughout the city. However the road conditions sucked, there was not a lot of fans cheering us on, and only a few bands that I can recall. However, it was cool seeing Kara Goucher and Shalane Flanagan run this race. The expo the day before the race was very large and full of vendors. Typical for a Rock n Roll race which was definitely needed this time around. I purchased my first pair of Bluetooth headphones courtesy of Jaybird and I love them. Yes, charging headphones can be annoying but its nice not to have a cord attached to my iPod. The expo was right by our hotel and close to the start line at the New Orleans convention center so it was very convenient. Afterward, we went shopping at the mall on canal and just relaxed before race day. The race started at 7 am and since we purchased more the 150 dollars at the expo we got to use special port o potties and by special I mean, not the typical ones, nicer but still smelly of a port o potty. It was pretty warm, but starting off it was a little chilly. So I had on my long sleeves and took it off about a mile in and Gear check was pretty simple just had to find the right truck. The race started and took us a little loop around to get to St Charles where a lot of the mardi gras parades take place and since mardi gras just ended there were still beads everywhere. The roads in New Orleans aren’t paved well and are known for not being paved well. As a result, my calves really took a beating as I wasn’t landing on them properly. There were not a lot of fans along the route until the finish line and I think I remember seeing maybe 2 bands on the half marathon course, but I could be wrong. The aid stations were plentiful and definitely needed as it warmed up. But seeing different parts of the city was nice. Then after we finished up downtown, we went out some road to I have no idea where and ended in a park. The park was nice but how we got there I haven’t the slightest clue. The after party was hopping with bands, lots of snacks and our mardi gras beaded medals. Note to future races, MAYBE provide a bag of snacks. Just saying. There was also some vendors present providing massages and a stretching area. However, unless you finished early you basically didn’t have a shot at getting a massage as the line was over 2 hours by 10:30. Gear check was easy and no problem picking up my stuff, just difficult again finding the right truck and there weren’t clear signs marking the shuttles back so mom and I ended up walking in a huge circle. We finally made it to the shuttles and they dropped us off not in the same spot as the start of the race so that was not so convenient. 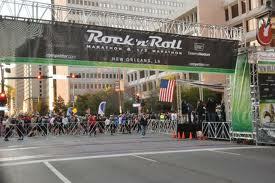 The course was definitely cool running through New Orleans however I wouldn’t do it again. it was an okay race and nice to check Louisiana off the list but still, they could improve it. Ehh, not a fan…: the pavement, start and finish spots not int he same place, massage line.